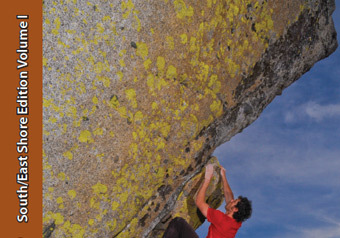 Bouldering Lake Tahoe-South/East Edition features over 3,500 problems at 30 different areas.This is a comprehensive guide covering every pebble that has been wrestled on the south and east shores of Tahoe. Some of the areas included are: Phantom Spires, Lovers Leap, Benwood Meadows, Flagpole Peak, The Beavers, Luther Pass, Burnside Lake, Kirkwood, The Pieshop, The Zephrys, Incline Village and much more. It has full color photos of all the boulders, topos, overview maps, breathtaking photography and everything else you need to get you to the boulders.This book is written by local climbing pioneers Dave Hatchett, Jon Thompson and Frank Lucido, so you can be assured the info will be accurate and up date. It is currently under construction and will be available in summer 2014. Any early editions of your book available for purchase? No. You will have to wait untill they arrive from printer. South/East guide should be here around August 1st. Heard the book was out! Where can I purchase it in the SF area? My distributor got the books today and he will be filling shop and gym orders this week. You should be able to get it at the Touchstone and other fine gyms in the bay by the middle of next week (august 19/20th) at the latest. The link should be ready to order it online from my website by tomorrow. All the tahoe Shops already have it.